Hang on … Toastable KitKats? No need to book an eye test; you did indeed read that correctly. These pudding flavoured sweet treats puff up and go crispy when toasted, resulting in a KitKat that is more like a warm, biscuit-y dessert than a bar of chocolate. 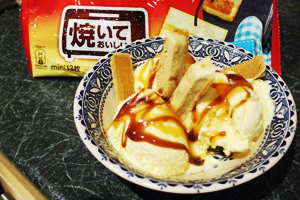 When we in the Japan Centre Online hub first found out about them, it took us approximately 0.18 seconds to decide that we needed to get our hands on these tasty treats and try them for ourselves. Although these KitKats are perfectly fine (and really tasty!) to enjoy without any sort of toasting, we found that toasting them gives them a flaky, almost croissant-like mouth feel that compliments the creme brulee flavour perfectly. However, toasting them successfully appears to be something of an artform as it took several volunteers, a variety of different grill and oven settings, and multiple failed attempts before a delicious baked KitKat became a reality. 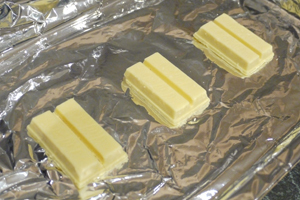 Therefore, in order to save our loyal readers from burning their fingers, houses, and/or patience, here is a handy guide on how to make amazing baked Kitkats on your first attempt. We trialed different oven and grill settings, and found that a conventional oven set to 180 degrees celsius yielded the best results. Allow your oven to preheat for about five minutes and arrange your unwrapped KitKats on a baking tray lined with aluminium foil. 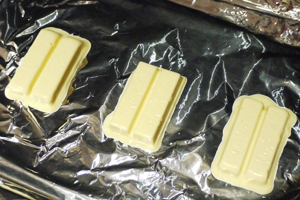 Next, slide your KitKats into the preheated oven. They will take approximately 4-5 minutes to toast, but this can vary greatly depending on the oven. As such, we recommend you check your KitKats every 1-2 minutes, at least the first time you toast them. They are ready when the chocolate has bubbled and puffed up slightly, and the bottom and edges have turned golden brown. 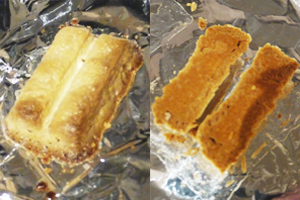 As the KitKats are toasting, the chocolate will start to melt and the KitKats will look like the picture on the right. Don’t panic – this is normal! Once the chocolate has risen to a certain temperature it will stop melting and start to go crispy and crunchy. As stated above, these KitKats are as suitable as a warm dessert as they are a crunchy morning or afternoon snack. Make them the warm component of an elaborate chocolate sundae or parfait and impress friends and dinner guests. They are also super tasty to enjoy the next day as part of a packed lunch. And there you have it! 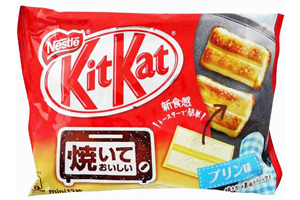 This all might seem a little bothersome at first, but we guarantee that your patience will pay off because these toastable KitKats really do taste incredible. Let us know what you think of these and our other KitKat items and recipes, either by commenting on this post or by posting on Facebook or Twitter. Nestlé KitKat Bakeable Custard Pudding Share Pack – Buy Now! Nestlé KitKat Bakeable Custard Pudding (Individual Bars) – Buy Now! Posted in Uncategorized and tagged cooking, how to cook, KitKat. Bookmark the permalink. I just bought a package of these today. I can’t wait to try them. Maybe I could give up America and go become a Japanese citizen. Even Japanese sandwich bread is so much better than ours, it makes grown men weep.